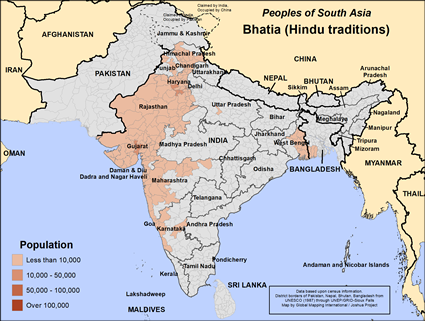 Bhatia is a group of people, and a caste found in Punjab, Rajasthan, Sindh, and Gujarat. Bhatia people of India were warriors in their history; now they work mainly in commerce and trade. They say they are descendants of Kshatriya or Rajputs. During the sixth century, Raja Bhoopat ruled in Lahore and his dynasty was called the Bhati or Bhatti dynasty from which the Bhatia name originated. They live mainly in Punjab and Delhi and many have gone to other countries. Bhatia, main groups are Jats, Punjabi, Halai, Jakhar, Navgam, Kutchi and Veha. They are called by their group name, for example Punjabi Bhatias. They have formed groups or clans. They have different dress styles depending on where they live. Bhatia people are successful in trade, commerce in textiles, cotton, steel, iron, shipping and mining. They cremate their dead and the ashes are immersed in the River Ganges, which is regarded as holy. Infants to the age of five years old are buried and there is a death pollution period, usually for twelve days, ending with a feast. Widows may not remarry. Bhatia people are primarily Hindu and worship Hindu gods. They also worship family, ancestors, and village gods. They follow a Hindu sect called Pushtimarg. They celebrate Hindu festivals, and a New Year festival called Makar Sankranti, exchanging sesame seeds combined with jaggery (unrefined sugar). Some Bhatias are Sikhs and Muslims. Adequate visual, audio, and video Christian resources are available in he Hindi language, but Bhatia are still an unreached people group. The most important need is for Bhatia people, Hindu, Muslim, and Sikh to understand that their good works and worship of false gods will never pay the penalty for their sins, and thatAlmighty Creator God has made provision for them. * Pray that Bhatia people will see that their old systems of ethics and religion are not working, and that their only hope is in Jesus Christ. * Pray that intercessors worldwide will pray for salvation of Bhatia people in India.View Bhatia (Hindu traditions) in all countries.